What Tickles Your Fancy is the theme for the 2009 Guild challenge. The challenge is open to Guild members only and entry is free. Quilts may be made using any technique or material. However, they should conform to the definition of a quilt, i.e. three layers. You can obtain a copy of the entry form from the guild office or download it here ( 75KB). The quilts are displayed at the Guild's end of year general meeting at Burwood on 21 November and the winners and Viewers' Choice are announced. Afterwaards, the quilts become a touring suitcase exhibition travelling all over Australia for up to two years. They are returned to the makers at the end of the tour. NB: The new travelling suitcase has different dimensions so the new quilt size for the 2009 challenge is 40cms x 60cms (16 x24 inches) - portrait or landscape with hanging sleeve. Entries close on 25 September 2009. 21 February - MARKET DAY. Guest speaker - Trish Bloomfield with vintage quilts. Please contact the Guild office to book a table for the market. See the Guild website for more information. Amanda, Bernadine, Kathy & Sarah share the joys of quiltmaking. Take a look at what these creative Guild members are up to and don't forget to leave a comment while you are there. To acknowledge and encourage our country membership, the Quilters Guild of NSW is initiating a support program for you to bring a tutor to your country area of NSW. At the time of applying, the applicant must have been a member of the Guild (individual or group) for at least one full year and live in NSW. All workshop participants do not have to be Guild members. Application for funds should be made at least six months in advance of your workshop. Tutor must be domicile in NSW or Canberra or be in NSW or Canberra already at the time of the workshop. The workshop participants must cover the tutor’s workshop fees themselves. Travel expenses, own car, hire car, bus, train or plane travel will be considered. For private car travel, (a per kilometer remuneration will apply depending on type of car, as per tax scale) from home or previous destination to workshop venue and return within NSW and Canberra. Short taxi hire. One or two nights accommodation close to the workshop venue providing the tutor lives or will be traveling over 80kms to the workshop or from the workshop. If the tutor is being billeted, an accommodation/meals benefit of $50.00 per night will be paid. Meals for the tutor during the stay for the workshop. General organization expenses up to the value of $50 for phone calls, email and postage expenses. Download an application form. The Guild can provide a list of accredited and experienced teachers and the types of work they are prepared to teach. Contact the Guild Office on 02 0293 3737 or email office@quiltersguildnsw.com, or Workshop Convener, Yvonne Line 02 4628 1170 for details. The Guild has allocated a budget for the cost of having overseas tutors in Sydney and we would like to extend this facility to our country members in the future. If you are willing to organize a workshop in your area, we are compiling a list of those interested in being informed of future plans. Vikki Pignatelli, American quiltmaker, lecturer and teacher, is coming to Australia with the support of the Barbara Meredith International Tutor Trust in April and May 2009. The Committee has booked her to do a lecture on Saturday, 2nd May, 2009. Vikki has developed a simple layering technique that is a blend of piecing and appliqué. 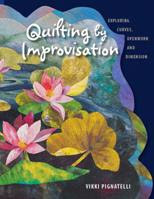 She is the author of two books featuring this technique, “Quilting Curves” and “Quilting by Improvisation”. The lecture will be held at the Epping Creative Leisure Centre, Saturday, 2nd May, 2009. Time is 1.30pm for 2.00pm start. The lecture ‘10 Attributes that Make a Good Quilter Better’ is for one hour. A question and answer session and showing of quilts is included. All members, guests and interested persons welcome. The entry fee is $10.00. A light afternoon tea will be provided. If there is sufficient interest, a 3 hour workshop can be organized for the morning. At least 16 people would be required. The fee will be approximately $50.00 (yet to be confirmed due to cost of A$) A $25.00 deposit will be required by 1st April, 2009 to hold your place. The balance will be advised with date of final payment. 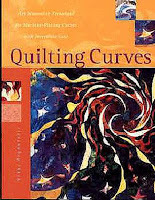 There are two workshops ‘Crazy about Curves’, making curves fun to do, without the hassle of measuring seam allowances and ‘Scrap the Pattern-Improvisational Curves, an impromptu approach to piecing curves, offering total freedom in quiltmaking. Please state which workshop you would be most interested in and we will book the one with the most interest. To register your expression of interest, please e-mail the office or leave a clear telephone message on (02) 9283 3737 or (02) 4628 1170. Please get your friends together and support this initiative. We can’t do it without your support!